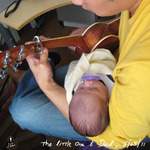 How to play the ukulele & hold a baby at the same time! 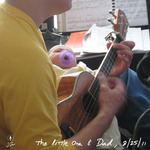 The birth of our daughter has inspired a whole new set of tunes on my uke! My father-in-law asked a great question while i was rocking her to sleep and playing a jazz mandolin CD on the stereo. He asked, "Hey, were you playing the uke at the same time???" "I wish! Wouldn't that be awesome?" and then i thought..."Hmmm, what IF?" Left arm supports her neck and head, while still able to use left hand to fret chords. Check! Left leg is raised to provide "lumbar" support to baby's already swaddled back. Check! Right leg is lowered to provide optimal angle for baby's legs to rest upon, without spit up. Check! Right hand still able to hold ukulele and strum at the same time. Check! Ukulele body gently holds swaddled baby in place. Check! Check! Best of all, the strumming and songs gently put her to sleep in about 15 seconds. Triple CHECK! Little peanut, your mom and I love you unconditionally, thank you for existing, and letting me play my uke at the same time!